Let’s Get Political: For brands, that is the question. There’s no doubt that politics has become a huge part of our everyday lives. So how are brands responding to this? Brands need to decide not only if, and when, they will address today’s controversial social/political subjects—but most importantly how they will do it. It’s always a risky move for a brand to get involved, but I think it’s valuable for consumers to know where a brand stands on such important issues. And I’m apparently not alone. According to Edelman, 60% of millennials are “belief-driven” buyers. A recent survey by Sprout Social published earlier this year in Adweek agrees. In it, two-thirds of consumers said that it was either “somewhat important” or “very important” for brands to take a stand on social/political issues; only 11% said it wasn’t important to them at all. 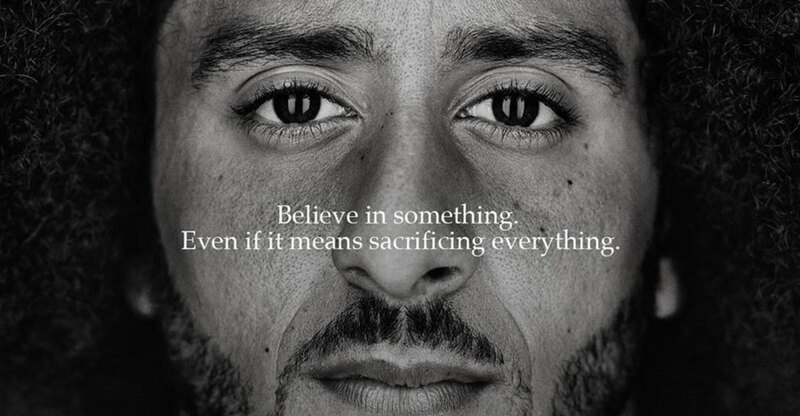 This campaign caused quite a divide among people: While some supported it, others burned their Nike apparel on social media. It got people talking—and buying: A win for Nike, which had a $6 billion increase in sales since the campaign’s launch. I think they did their homework and clearly understood their customers. That didn’t appear to be the case with Starbucks’ “Race Together” campaign, which backfired in 2015. The campaign’s goal was to initiate talk about race relations. Baristas were given the opportunity to initiate conversations with customers by writing “Race Together” on the cups of customers of another race. Starbucks was criticized by people on both sides of the political spectrum for going too far into a hot-button subject. Like Nike’s campaign, people were still talking about it—just not positively. I think Starbucks meant well and just wanted to get the conversation started. They just didn’t go about it in the right way. And once things get out in the public (and especially on social media), it’s easy for a message to get misconstrued. Some brands attempt to skirt controversy by taking a more socially responsible approach, where they don’t actually take a point of view but instead let the people be heard. Freeform and Sprite did a good job creating social responsibility campaigns that push people, mainly millennials, to get out there and be heard, no matter what their stance is on a topic. Freeform used celebrities to encourage voter turnout—reinforcing that voter wait time only equals 11 minutes, and that ordering a latte, eating a burrito, or endlessly scrolling through Instagram takes longer than voting. Sprite’s “Get Vocal” campaign provided a platform for voices to be heard on what matters to them. People uploaded videos to a prerecorded beat that they could freestyle rap to. Both of these approaches gave their respective brands the opportunity to get involved in social or political issues without taking a stand—or the risk that goes along with it.